Preview pane shows the result of rendering. Three modes (Preview/Render/Test) are available. The number of frames for preview or render are set in preference page. The 'File'-'ExportImage' command will use the frames for 'Render' irrespective to preview mode. 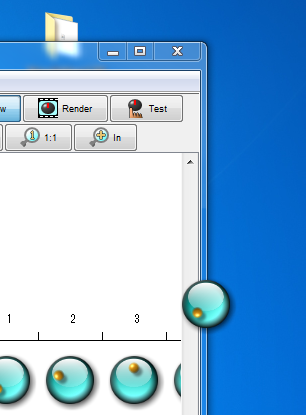 'Test' mode shows the result of animation with mouse dragging, mouse wheel rotation or cursor up/down. Selection of the menu 'Test' will make the floating image of the knob that can be moved to outside of window. 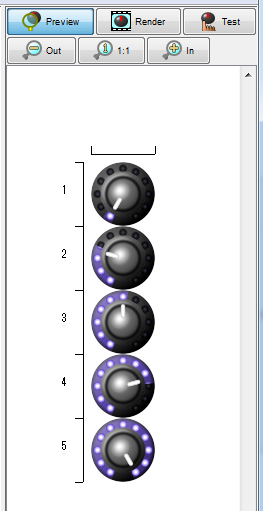 This will make easy to confirm how looks the knob on background image. To hide the floating image, click right button or select the menu 'Test' once again.